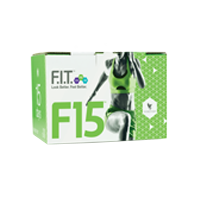 Take the next step to looking and feeling better; it doesn’t matter if you are just getting started, or if you’re already an expert, F15 has beginner, intermediate or advanced nutrition and exercise programmes to help you on your fitness and weight management journey. Each fifteen-day programme has been specially designed to provide you with the knowledge that you need to get inspired, help you make permanent changes toward a healthier lifestyle, and continue in your transformation. N.B. For comprehensive instructions use the step-by-step F15 booklet provided in this pack. For the complete list of contents and ingredients please click here.